Well, it's been one whirlwind of a week and next week looks to be even more blustery! I got a lot of last minute shopping done, projects accomplished and also held my first card class (a Disney Christmas Card assortment) at Scrapper's Boutique. It was so fun that I think I'll do some other class again after the first of the year. For now, though, I've decided to step in and work there on Saturdays, taking Jen's place while she's on maternity leave once Baby Boy del Muro comes. I'm very excited and today I am "in training" on how to run the cash register, etc. For all of ya'll out there that know me and are local, come see me in action and take in all the fun stuff SB's got to offer (but be nice--I'm still learning the ropes)! Then tomorrow will be Christmas with our extended family, since we'll be at the Magic Kingdom for Christmas. Wish me luck in getting the Snuggie in our "As Seen on TV" Chinese gift exchange. I'm sure I'll take it with us on our trip along with jackets, pants, shorts and bathing suits. The weather has been anywhere from the 50's to the low 80's this week in Orlando, so we just won't know what to expect until we get there. Anyway, on to why ya'll are really here--It's Jen's Sketch For You To Try time, right? I LOVE my card I did for today's sketch. I have to admit to altering it just a tiny bit by adding the brown vertical panel, but it just "needed" it. 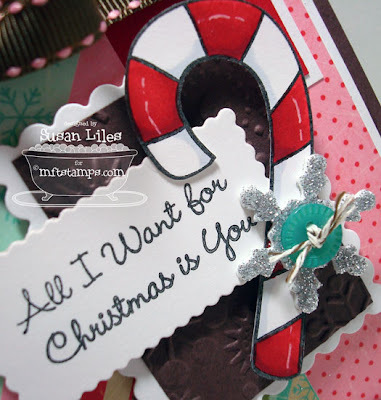 The candy cane is from the Santa Baby set from My Favorite Things. It's really a great stamp. I actually colored and cut out two of them, so ya'll may be seeing another one soon! 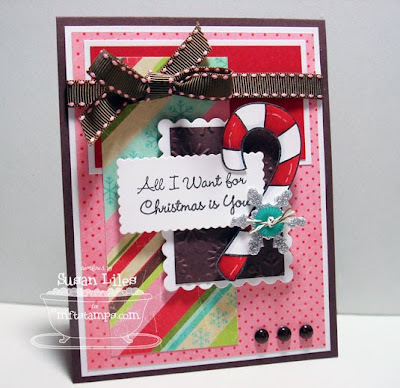 (Since I really like this card, I may even CASE myself and just change out the papers and sentiment!) OH, I almost forgot! See those cool brown little accents? Those are new to MFT--Glitter Garnishes. They are so cool and sparkly and have glitter inside them! Ya'll are going to want them all! SUSIE Q-TIP: There's nothing wrong with CASEing yourself. (CASE is an acronym for Copy And Share Everything.) It makes you feel like you've inspired someone. Or that you are having deja' vu. This is amazing!! I love that candy cane!!!! Awesome sketch card, Susie...always bright and colorful from you. For sure to make me smile! Now I have that song stuck in my head! How cute is this? I Love the papers and all the details! Super, super cute! love it! we are watching "love actually" which has this song!...one of my faves! Sus, what a great mix of colors, patterns and textures! The candy cane looks good 'nuf to eat, and if George saw it, he'd try to pull it right off the screen! Great card! I like the combination of colors you used!